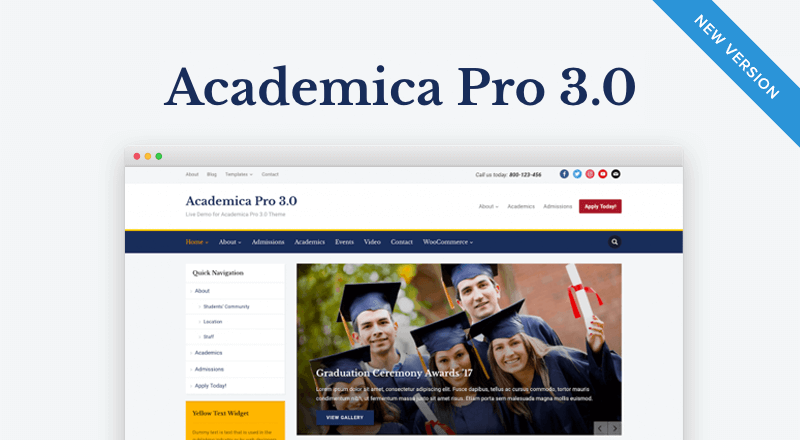 It has been over 2 years since we have released one of your favorite themes, the Academica Pro. We have decided that it is time to freshen it up a little bit with a more extensive update. 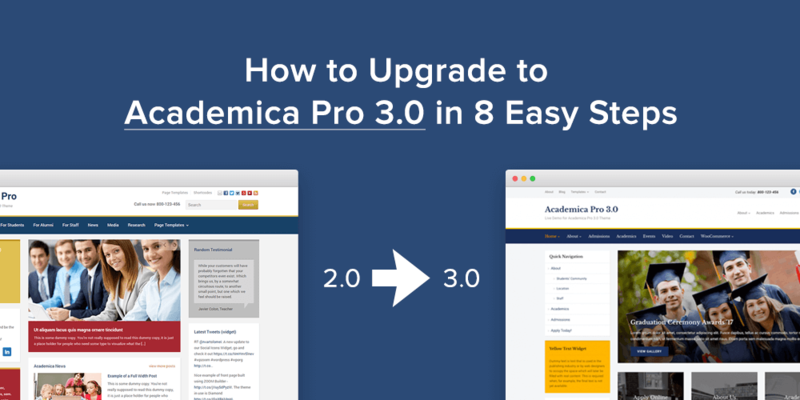 Let’s take a look at what is new in Academica Pro 2.0. Removed the built-in Events custom post type in favor of support for The Events Calendar plugin. Academica Pro has been designed with a 3-columns layout in mind, even if it comes with the ability to use it just as a 2-columns layout. 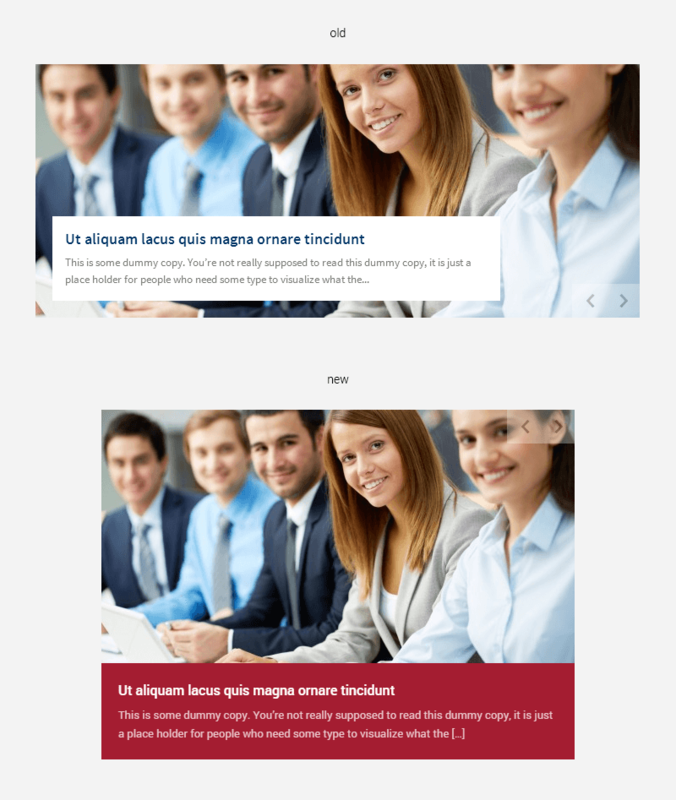 Because of the previous 960px width these 3 columns were rather small and felt crowded. Now we have more space to use, some extra padding has been added, all the widgets look much better now that the sidebars are wider. The untrained eye might not spot any color changes at all, but they are there. 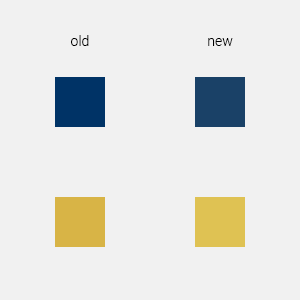 The blue and golden colors that we previously had were a little too strong, the new ones are more neutral. The Typography has been improved a lot as well. We replaced Source Sans Pro font with Roboto, which is much more pleasant to the eye. Now that we are using Roboto, the main menu and widget titles are no longer in CAPS. The previous slideshow was cropping the thumbnails to 710×300, which is a weird size for many types of photos. It was difficult to upload photos that would look good and natural. The new slideshow uses 560×300 thumbnails. Previously our Theme Options page had some styling options for main colors and fonts. 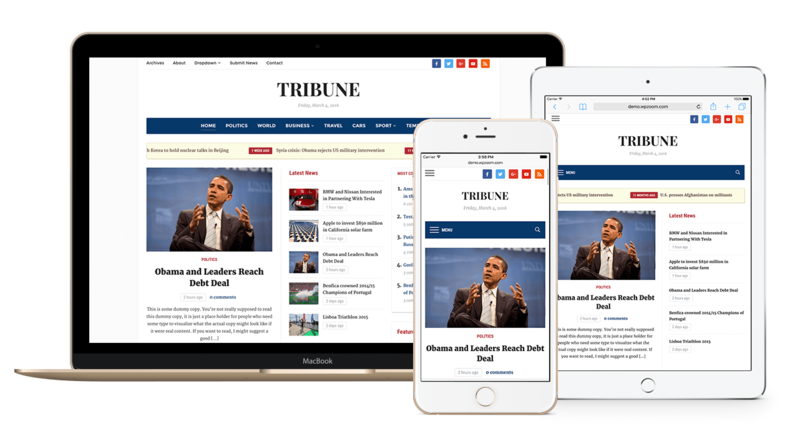 The new version uses provides better customization options that you can preview live thanks to the WordPress Theme Customization API. You can access this feature from Dashboard > Appearance > Customize. Many of our older themes come with a couple of outdated widgets for Twitter, Facebook, etc. 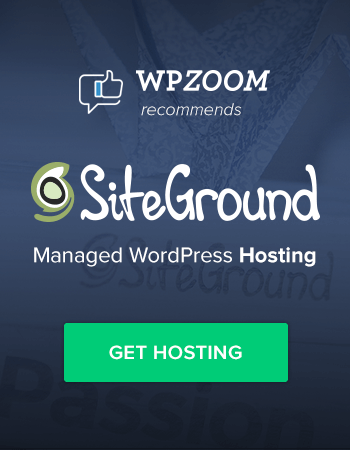 We have decided to remove them in future theme updates in favor of specialized plugins. For example we have some wonderful (free) plugins: Twitter Widget & Social Icons Widget. 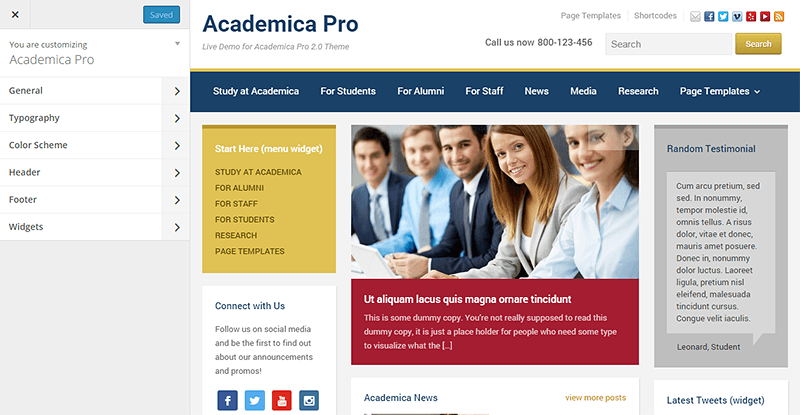 The initial version of Academica Pro theme came with a custom post type for Events. It was a good idea at first, but many customers found it difficult to customize and adapt this built-in feature. One of the major problems was the localization of the date format and the filtering of Future/Past events. We decided to completely remove this feature from the theme, and instead we added support for a very popular and cool plugin called The Events Calendar. Now you can create and display events in a much more efficient way, with maps, venue details, etc. The new update is available for all existing customers, and you can download it in My Account area. Feel free to let us know what you think about this update in the comments below! I was thinking, can i change the featured image size of the image in this theme? Also i want my theme to automatically fetch featured images on homepage from the post page itself…Is this possible? Sorry but I do not understand. – Why redo a Version 2 (the changelog between the 1.2.2 and 2.0 is also differ between academica203 and academica2/pro v2015)? – Where is the 2.0.3 version? – There is no update (203 to new 2.0 v2015)? – What happens to former users of “old” version if 2.0.3 no longer exists? 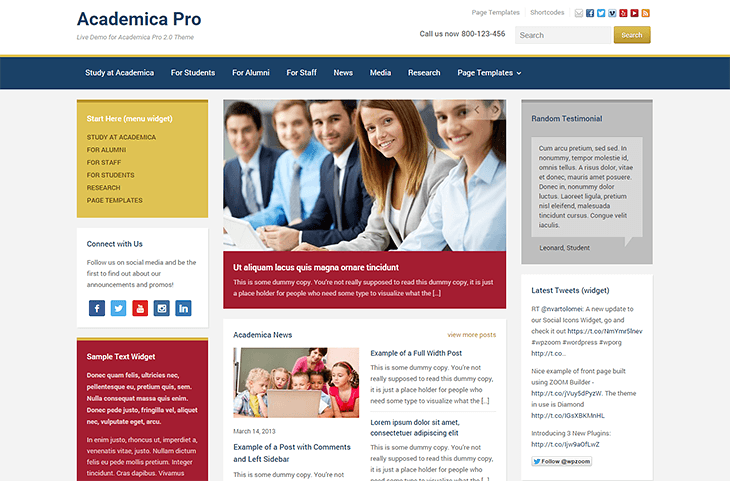 The old version of Academica (free) theme was retired, and replaced with the version for WordPress.org. Most of the changes you list sound good, but I’m concerned about my slideshow. I have cropped all my slideshow images to 710×300. What will happen to them? Will they become distorted? The width of the slideshow has been reduced, not increased. So once you run the Regenerate Thumbnails plugin, WordPress will create thumbnails of the new size (it will crop the sides in this case). While I like the Roboto font, I have to say I don’t care for any of the other changes you made. I ultimately went back to the previous version of Academica Pro. My web sites just didn’t look as good, or function as well, with your upgrades. Hi there, I’m building a website using the Academica theme, and I can’t figure out how to make the header image that I upload look right/be cropped properly. The problem seems to be that the header image size is responsive depending on the size of the computer screen being used — so on my laptop it looks fine and the full image is visible, but on a larger screen the image is very badly cropped and cut off.How can I fix this so the full header image is visible on any size screen?